Ami Bennett Agencies announces a new collaboration with the American Autism Association to support the needs of local families who face the many difficulties inherent in raising children with autism. It’s truly heartwarming to see the love and support families find with the American Autism Association...we feel privileged to help raise awareness and funds for this incredible nonprofit organization. Ami Bennett Agencies has unveiled a new charity campaign in their ongoing community involvement program serving the families of greater Camas and Vancouver, WA. 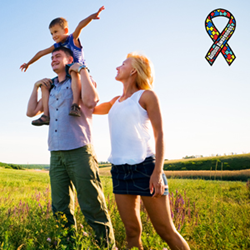 The American Autism Association serves families who face the many difficulties inherent in raising children with autism. Compassionate community members who wish to join the campaign may contribute here: https://www.crowdrise.com/letsadvocateforchildrenwithautism/fundraiser/amibennett/setup_success/member. The American Autism Association was only started in 2010, but their impact has already been significant. Their mission is to help families affected by autism who either cannot financially help themselves and their children, or who simply do not know how to help themselves. Providing no-cost educational services and essential therapeutic interventions, they strive to provide better care for children on the autism spectrum, as well as raise autism awareness and acceptance so that individuals may function as meaningfully and independently as possible. In just a few short years, the American Autism Association has helped over 6000 families through their Hotline, developed and maintained 12 therapeutic recreational programs for low-income families, and raised over $400,000 to expand their programs and assistance. They rely heavily upon kind-hearted donors and volunteers. Utilizing its own resources and seeking the help of its vast network of customers and business partners, Ami Bennett Agencies marches on to ensure customers, friends, family and neighbors are always in good hands. Social media and an email awareness campaign will be used to help the agency’s caring team to spread the word about the campaign for the American Autism Association. They have also featured the cause in their monthly magazine, Our Hometown, which is delivered to thousands of households in the Camas and Vancouver metro areas. The electronic Flipbook version of the current issue may be viewed here: http://www.amibennettagencies.com/Our-Hometown-Magazine_46. Supporting their latest Community Cause has never been easier, as Ami Bennett Agencies has pledged to donate $10 to the American Autism Association for each and every recommendation they receive for an insurance quote, with no purchase necessary. Readers who would like to view the campaign, recommend a friend or make a personal donation may do so by visiting: http://www.amibennettagencies.com/Lets-Advocate-For-Children-With-Autism_8_community_cause. The agency just recently launched their master charity program, promising to choose a new local organization, family or person every two months to receive support. Information about past campaigns is available at: http://www.amibennettagencies.com/community-cause. To learn more about Ami Bennett Agencies and the American Autism Association, readers may visit: http://www.amibennettagencies.com/ and https://www.myautism.org/. Serving families from offices in Vancouver and Camas, WA, Ami Bennett Agencies is a full service, award-winning insurance firm whose mission is simple: to provide the best insurance and financial services in the industry, while delivering consistently superior service. Ami Bennett and her team of caring professionals believe in protecting all the things which are most important to their clients (their families, homes, cars and more), and in helping to prepare long-term strategies to enable financial success. The dedicated experts at Ami Bennett Agencies may be reached by calling 360-834-3992.